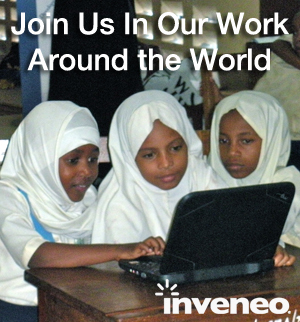 Inveneo is committed to bringing real economic and education opportunities to Haiti in 2011-2012 through the Haiti Connect Cities program (also known as the Haiti Rural Broadband Initiative) and its related efforts. Launched in January 2011. 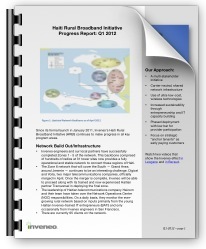 Haiti Connected Cities is a collaborative program involving Haitian Internet Service Providers (ISPs), Haitian IT entrepreneurs and the many organizations – NGOs and otherwise – that will benefit from access to reliable and affordable broadband Internet. In the case of NGOs, the increased efficiency [from broadband Internet connectivity through Haiti Connected Cities] drives development outcomes by allowing the organizations to better deliver their services through increasing beneficiary access, service quality and timeliness. If you would like to be involved with the Haiti Connected Cities program, please connect with us now.